On February 25, Izabella Kaminska in FT Alphaville blasts the forecasting ability of the Vix futures, a CBOE futures contract that measures the volatility of the S&P 500 stock market index. 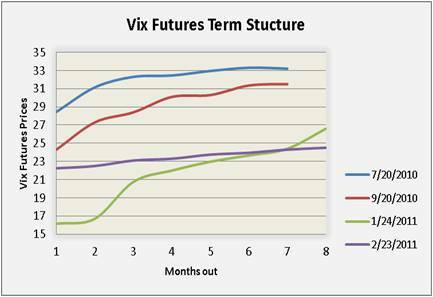 Since 2009, the Vix futures has remained in contango–meaning that the far out prices exceed the near delivery future prices-and Vix futures repeatedly exaggerated their predictions of the actual volatility. 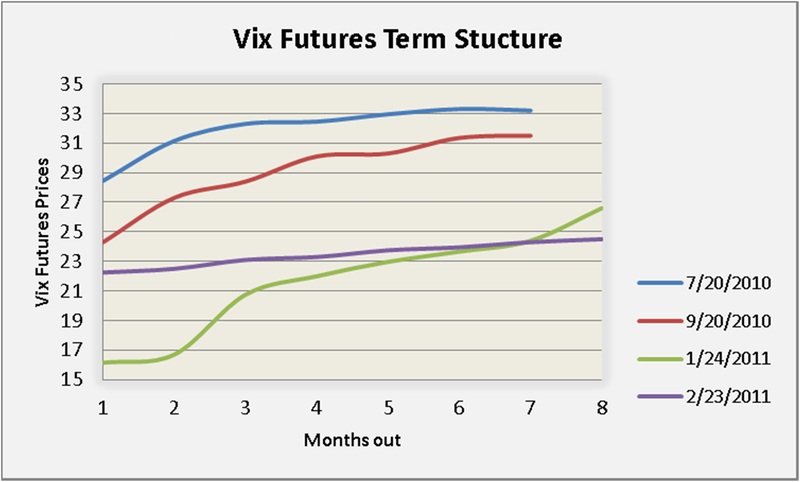 The first graph below shows the term structure of the Vix futures contracts for several trading dates in 2010 and 2011. The graph indicates that the futures curve has remained in contango. A closer examination indicates a relationship between the level of volatility and the steepness of the curve: A higher (smaller) level of the spot/near term volatility seems associated with a less (more) pronounced contango. 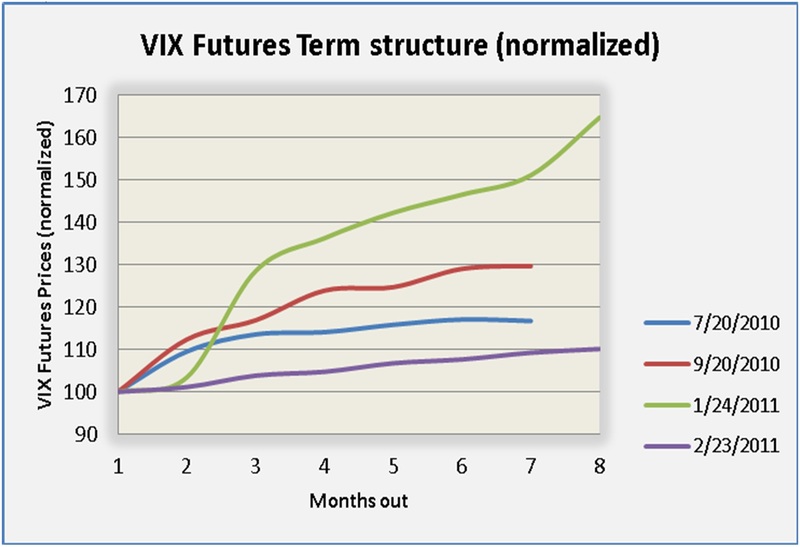 The second graph shows the same relationship after normalizing the near term futures price to 100. On July 20, 2010, the near volatility was 28.45 and the far out volatility was 33.2, a 16.7 percent higher. By January 24, 2011, when the near volatility was a much lower 16.15, the far out contract was 26.6, a whopping 64.7 percent difference. When is an end-user not an end-user? When it’s a derivatives dealer. Is that true? Certainly the law didn’t expressly name United Airlines or Shell Energy. It simply exempted end-users—the very non-financial companies organized to produce real goods and non-financial services that trade derivatives to reduce the financial risk arising from their commercial activities. These are the types of companies and the type of risk management that this blog is expressly targeted to. But I was taken aback to see the New York Times identify Shell Energy as an “end user” that “the law exempted … from the clearing requirement.” Of course, the average man-on-the-street thinks of Shell as a company with gas stations, refineries, storage tanks and oil wells. It is. But that’s not the whole picture. The average Wall Street investment banker running an energy derivatives trading desk also thinks of Shell Energy as one of its biggest competitors, dealing derivatives and running a proprietary trading business. 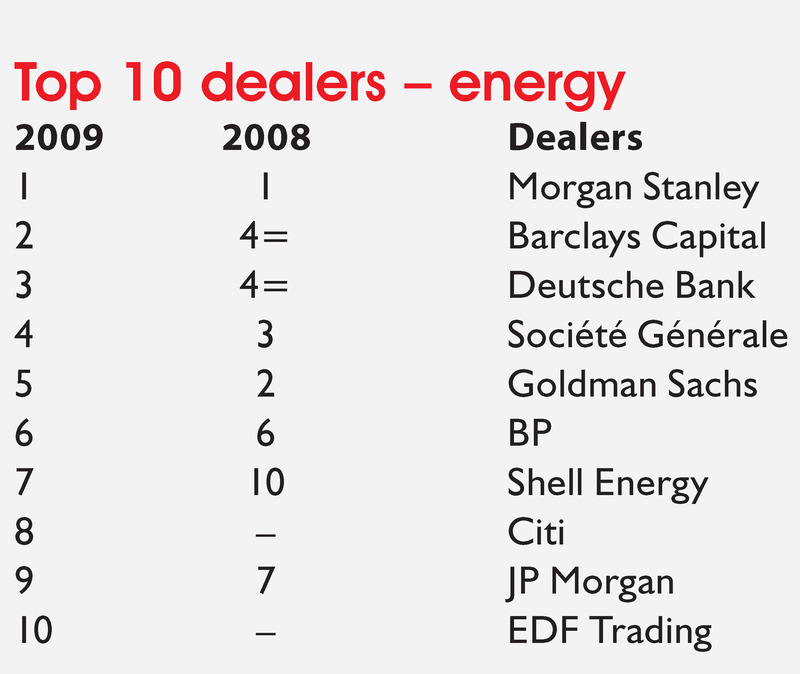 Reproduced below is the awards list for the top 10 derivatives dealers in energy in 2009 as ranked by the financial industry magazine Energy Risk. Shell is at seventh place, following Morgan Stanley, Barclays Capital, Deutsche Bank, and others. Surely the banks on this list don’t count as “end users” and neither should Shell’s dealer business. Shell the oil producer, refiner, shipper and marketer is an end-user, and Congress expressly drafted an exemption for this type of commercial activity—under certain circumstances and with certain provisos yet to be fleshed out in detail. But, Shell the derivatives dealer and prop trader? Why should they be exempted? Surely not because they happen to be owned by the same parent company that owns the wells, refineries, storage tanks and gas stations. Accelerating costs of drug development and uncertainty surrounding the feasibility of many compounds to reach the marketplace have lead large pharmaceutical companies to resort to independent research organizations for early stage drug development. This helped pharma companies focus on license-proven, later-stage development of compounds with a record of safety and efficacy. Recently, however, pharma companies have become interested in biotech firms. Roche acquired Genentech in 2009, and Sanofi-Aventis has just agreed to takeover Genzyme. Eli Lilly also wants to move upstream. The company is joining forces with venture capitalists to launch three new funds ($750 million) that will finance pre-clinical and early stage clinical tests on molecular technologies by standalone firms in partnership with external researchers. This will help Eli Lilly develop more drugs faster, and give it preferential access to potential successes. Here is the Financial Times piece by Andrew Jack. Why is Eli Lilly deal clubbing with VCs instead of going it alone? Can’t the company raise $750 million? Presumably Eli Lilly has a limited ability to raise funds. More important, public markets for equity and debt are ill suited to back highly risky ventures. Institutional and retail investors prefer bets they can make sense of, benchmark to the stock market index, and quick returns. Perhaps the main reason for Eli Lilly’s foray into early stage R&D is that it provides the company first right of refusal after proof of concept. Acquiring licenses and seeking agreements with independent labs after an initial success can be expensive and frustrating, as many pharma companies compete fiercely for a miniscule number of technologies that show real promise at preclinical trials. In this sellers’ market, by retaining preferential treatment Eli Lilly wants to avoid being drawn into aggressive contests that might end into costly failed bids or inflated purchases. Eli Lilly is redefining its boundaries. On paper it appears to be a smart move for a company that is anxious to rebuild its declining portfolio of patented drugs. But as with every strategy, success will be determined by how well it is executed. Sharing costs and risks is not obvious when Eli Lilly is the only insider, the buyer and user of the fruits of research also funded by other outside investors. Similarly with the management of partnerships with freewheeling and independent minded external researchers who want to maximize the value of their exit options when Eli Lilly has a right that effectively distorts an otherwise competitive market. Risk management models all assume well functioning markets. But building the markets themselves is a tough task. Sometimes the trading and the algorithms and such get way out ahead of the back room systems for execution. I’ve seen this topic recur in a number of settings recently, and its worth calling attention to them individually, and to the collective reminder that the plumbing is important, even if less glamorous. Today’s Financial Times has a long piece by Thomas Briathwaite on “Elusive Information”… “the creaking data architecture that underpins modern finance.” He calls attention to how a lack of information handicapped both managers and regulators during the Great Financial Crisis. Giving regulators basic information about the OTC derivatives market is one of the objectives of Dodd-Frank. Before that law was passed, whole parts of the market were simply dark as far as regulatory authorities were concerned. One of the ironies of the crisis in the credit default swaps market is that shortly prior to the crisis, the New York Fed had identified this as a market that had rocketed up in volume, all the while the back office was left far behind–see this archive of press releases on the subject. The NY Fed had begun a program to remedy the situation, but events overtook the effort. Another irony of the current political debates about an end-user exemption from the clearing mandate for OTC derivatives, is that the lobbyists demanding the exemption are loudly proclaiming the inadequacy of many end-users’ own ability to value the derivative instruments they own. They suggest that the requirement to put up the cash collateral will be burdensome because the companies do not have the ability to calculate the size of their potential derivative liabilities. But this admission of “inadequate plumbing” actually argues for the reverse. If they cannot anticipate the size of their accruing liabilities on a derivatives contract, then it is all the more important that the system demand they put sufficient cash aside up front. A company without adequate plumbing and no collateral requirement is all the more likely to be surprised when the bills come due. Fancy models are great. But they all assume that someone will have installed good plumbing. In many cases, we learn that the plumbing is a mess. It is a reminder that we need to look after these less fashionable parts of the business, too. Victoria McGrane at the Wall Street Journal‘s Real Time Economics blog covers the new release from Keybridge Research on the potential impact of collateral requirements that flow from the Dodd-Frank reform of OTC derivatives markets. The headline is “Study: Strict Derivatives Regulation Could Cost 130,000 Jobs”. What is the substance behind those numbers? 1. Estimate the notional volume of derivative contracts outstanding at US companies (S&P500): $3,344.9 billion. 2. Apply a 3% factor to these trades as the estimate of the collateral required: $110.05 billion. 3. Assume this collateral requirement is a deadweight cash flow cost to the companies. 4. Estimate the impact of a drop in cash flow on capital expenditure and therefore jobs. There are many potential points of contention in this calculation. But the big unexamined assumption is inside #3. There are two problems here–one micro and one macro. The micro mistake is the delusion that absent a collateral requirement companies are able to trade derivatives at no cost to their balance sheet. This is plainly not true. If you don’t back up your derivative trades with a cash collateral account, then you are backing them up with a promise that you are good for it, i.e. with credit. Companies have limited debt capacity, so using credit is costly, too. A regulation that requires using cash instead of credit costs the company on one side, but loosens its constraints on the other. The net effect on the company’s free cash flow is zero. Keybridge’s oversight here is a first order mistake. One could argue that the cash requirement is costlier than credit, but then you would have to figure out by how much. That would be an extra, very difficult step in the calculation, and any reasonable estimate for the differential would drive the headline number down enormously, possibly to zero. The macro mistake is to ignore the entire purpose of the regulation. The collateral requirement is an indirect result primarily of the clearing requirement. The objective of this and other elements of the reform is to reduce the total risk in the system. Some of the reduction should come from canceling offsetting positions that simply add to total credit risk. Some should come from reducing systemic risk. It’s always possible to ignore the systemwide purpose of a regulation and claim it is costly due to the burden it imposes on each transaction. You could do this for fire codes, for food and drug regulations and so on. But the only sensible way to examine the net impact of the regulations is to think through the full systemwide impact. One can have a good debate about whether or not the Dodd-Frank reforms will reduce the total risk in the system, and about what contribution a collateral requirement may make. But simply ignoring the systemwide impacts is not a useful contribution to reasoned debate on the matter. Previous posts directly related to the micro issue include this one and this one. Previous posts on the macro issue include this one, this one and this one. Insuring against snow storms with futures? Weather derivatives can be a useful instrument for hedging, and hedging is a kind of insurance policy. But it is useful to keep in mind how a futures contract is different from an actual insurance policy. A futures contract is written on a very specific commodity price or other well specified index. The snowfall futures contract is based on measured snowfall at a given location–such as Chicago’s O’Hare Airport–within a given month. It has a payoff that is very mechanically tied to that index. If snowfall impacts an airline’s business by cutting into revenues from flights, then buying a futures contract on the amount of snowfall may help reduce the total volatility of cashflow. This is where insurance policies have an advantage. When I have an automobile accident, my insurance company covers the damage, whatever the damage–less my deductible. If snowfall causes roof damage to my house, my homeowner’s insurance covers the repairs. It doesn’t make the payout contingent upon total snowfall in the month, regardless of whether I have any damage or not. The payout is contingent on the scale of the damage. When hurricane Andrew struck Florida in 1992, causing enormous damage, it was the scale of the damage actually done that caused the large insurance payouts, not the measure of windspeed or quantity of rainfall. A hedging strategy using futures contracts doesn’t have this flexibility to make the payout contingent on the actual losses incurred. This is another example of basis risk. Of course, in order for insurance contracts to offer this extra benefit of making the payout match the loss, they have to hire adjusters to investigate claims. Obviously there is room for a disagreement between me and my insurer over whether my auto or home claim is really covered by my contract and reimbursable, and what is the actual size of the loss. This distinctive feature of insurance–that the payout is directly tied to the amount of damage–is a costly feature. The transactions costs–in the form of adjusters, appraisals and disputes–are high. Futures contracts have low transactions costs by making the payout contingent on an easily measured index. But the tradeoff is that a payout linked to this index doesn’t quite match the losses. The Great Financial Crisis and the role played by certain financial innovations, such as credit default swaps and synthetic securities has made a number of people question the value of financial innovation. A premise of our risk management course is that financial innovation is valuable, both to the individual company and to society at large. But it is always useful to re-examine and question a premise. Here are links to some of the critiques that have recently been made in the public debate precipitated by the Crisis. Memorably, Former Chairman of the Federal Reserve Paul Volcker quipped that the only really useful financial innovation he’d seen in the past 20 years was the automatic teller machine. A more complete presentation of his thoughts can be found in a give-and-take with bankers and others hosted by the Wall Street Journal. Excerpts from the transcript can be found here. Princeton Economist, Paul Krugman, has written often in his New York Times column and blog that many forms of financial innovation have been harmful, not helpful. Some of these can be found here, here, here, here, here and here. MIT economist Simon Johnson and his coauthor James Kwak have also made a strong argument questioning the value of financial innovation in an article in the magazine Democracy, as well as on their blog, Baseline Scenario, which can be found here. The spread graphed is the difference between the price of the refined products produced from a barrel of oil and the price of the barrel of oil. 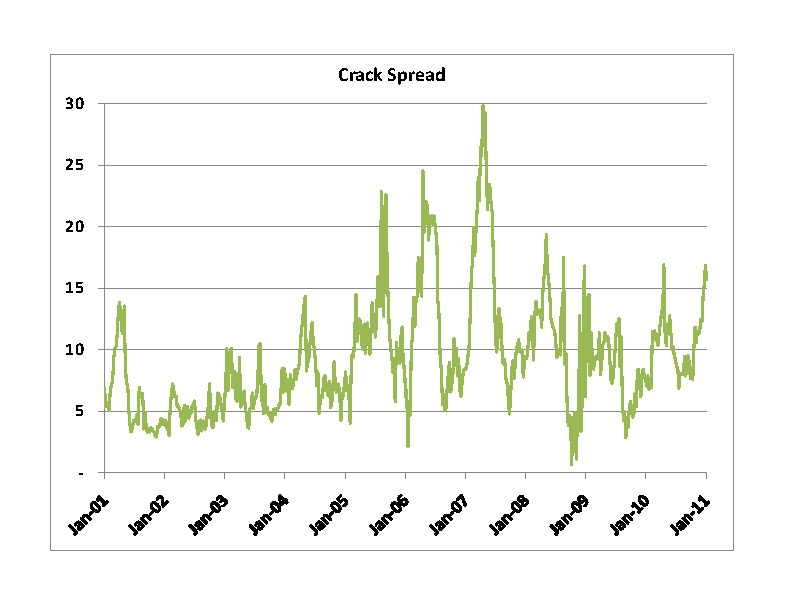 The graph shows the most widely quoted version of the crack spread, the 3:2:1 spread–i.e., 3 barrels of crude oil yields 2 barrels of gasoline and 1 barrel of heating oil. Clearly this spread swings significantly through time. This is a classic case of basis risk, which is just the volatility in the differential between two related commodities or between one commodity for delivery at different locations or different delivery dates. Basis risk undermines the effectiveness of a hedge built using a related commodity. Airlines that used crude oil futures to hedge their jet fuel prices are finding that the hedges are losing money at the very same time that jet fuel prices are going up. This is exacerbating the cash flow volatility that the hedge is designed to reduce.